3 star hotel with best service for traveller and business travellers! 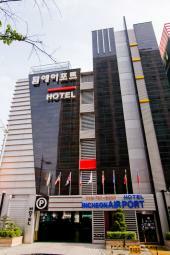 Incheon Airport Hotel, opened in February 2003, is a business accommodation located in the new airport town. Many tourist and business travelers with flights at Incheon Intl airport stay at our hotel. Diverse facilities provide comfortable stay and the impeccable 1 on 1 service attract many revisitors. Complimentary services including car rental, tour guide and indoor golf range are all available. There is even complimentary pick up service and tour information for foreign guests. All guestrooms vary in design, a delightful experience for revisitors. Nearby tourist attractions include Yeongjong Grand Bridge Exhibition Center, Eulwang-ri beach, Yongyu Island and Mui Island, all within 10 minutes drive.